[toc]Apart from the body, hair and skin, one needs to take proper care of the teeth. There can be a lot of problems that you can face if hygiene is not maintained and one of the most common ones is that of yellow teeth. One of the strongest reasons why people have to face this crisis is because of plaque formation on the teeth. Yellowness on the teeth is not only a sign of unhealthy teeth and gums but also one that causes a lot of embarrassment in public where attraction is concerned. 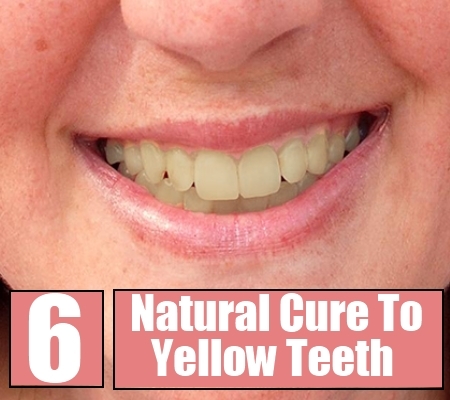 This list below will give you safe and 100 percent effective natural cures that can be used on a routine basis to get best results for treating yellow teeth. Make sure you follow it with due diligence to get exceptional outcomes. 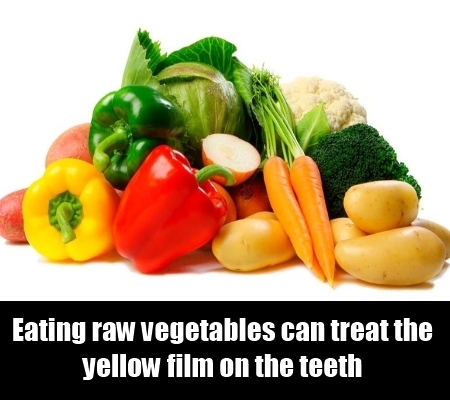 One of the ways in which you can treat the yellow film on the teeth is that of eating raw vegetables. This includes carrots, celery, broccoli and cucumber. The abrasive qualities of these natural products are known to scrub the yellow stains on the teeth and thus help you achieve the goals perfectly. These should be included in the daily diet to get the best results in hand. Make healthy salads from these raw vegetables and see how well it gives the outcomes. 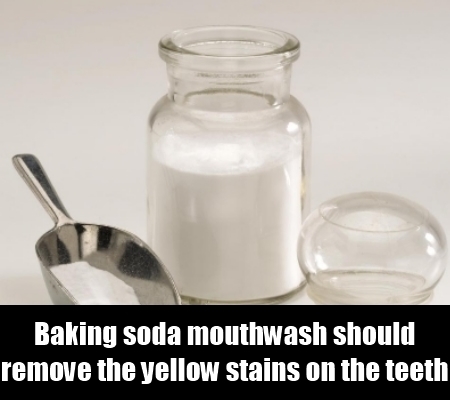 Mix well about two tablespoons of baking soda in a glass of cold water and use it to gargle the mouth well. This mouthwash should be used 2-3 times in a day to remove the yellow stains on the teeth. It is one of the top notch ingredients that can be used for the purpose of achieving the goals. It helps in treatment of minor stains. Diluted baking soda can also be used on the teeth for 2 minutes everyday to remove the yellowness. This should be done only two times in a week for the first week and then should be followed every 15 days. Excessive use removes the natural enamel of the tooth and should be avoided at all costs. The bleaching agents in the natural product that we know as lemon is what will help you remove the yellow stains from the teeth. You can either gargle the mouth with lemon juice diluted with a little water or else use the peel of the lemon to rub the teeth and cure the crisis. 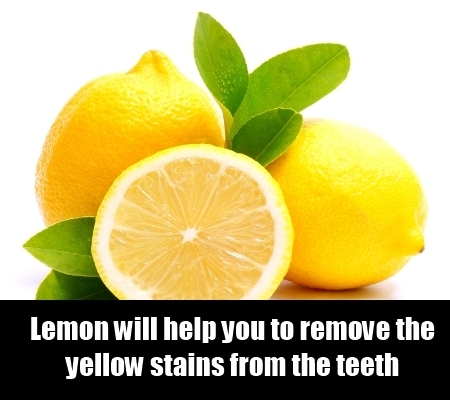 Lemon juice can also be mixed with a little salt and then rubbed on the teeth for the same results. This should be done vigorously. Rinse the mouth with normal and plain water after a few minutes. To remove tartar as well as the yellowness, follow this remedy two times in a day for the next couple of weeks. 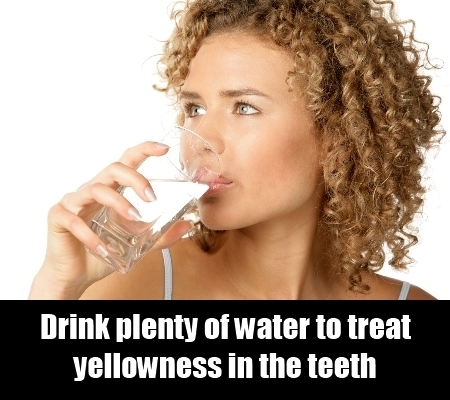 One of the easiest natural cures through which you can ensure the treatment of yellowness in the teeth is by drinking plenty of plain and filtered water. About 10 glasses of water is highly recommended in such a scenario. This will prevent the formation of any plaque or tartar in the mouth and also flush out the already existing ones that is causing the yellow teeth. This natural cure will start giving you visible outcomes in some weeks. 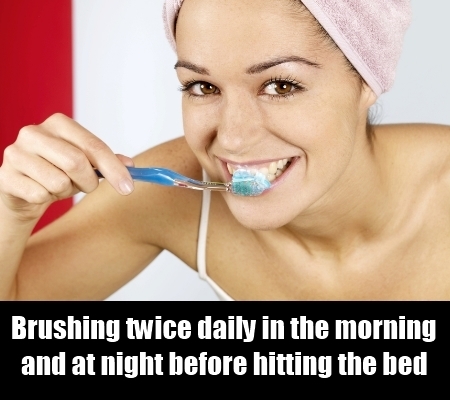 Brushing twice daily in the morning and at night before hitting the bed is one of the first natural cures that can be done for the removal of yellowness from the teeth. Apart from this, using dental floss will again remove the tartar from the mouth and trigger the treatment process. One should also gargle the mouth with salt and lukewarm water to kill the bacteria in the mouth that is causing the plague to form and to remove the one that is already there. Along with removing yellowness, it will help in keeping the teeth healthy and free from infections. 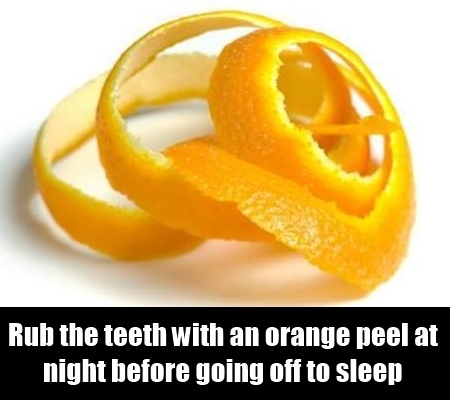 Rub the teeth with an orange peel at night before going off to sleep. This is one way in which you can reduce the yellow tinge on the teeth that is causing so much embarrassment. It is a safe and natural remedy and needs to be followed on a regular basis to get the results. It will also help in fighting the bacteria that accumulates in the mouth at night and causes yellowness because of the high levels of vitamin C. In only a couple of weeks, it will give you whiter as well as stronger teeth. Dried peel can be powdered and used for the purpose if fresh ones are not available.